Latest information regarding Ms.Natsumi Kogawa . English version is at the bottom. We opened facebook page. Please like this so that you can keep track of the latest info. We are organizing giving out flyers at the Vancouver Public Library downtown and at Holdem station. Natsumi hasn't been located yet. Please don't be distracted by wrong information. We are working closely with Police on this matter. She's been missing since Sep 8th. The last message from her to her friend was 11:30am on Thursday. Her friend sent her another message around 4:30 pm but she didn't respond after. She hasn't been back to her shared house. She left there with her black backpack, wallet, and iPhone. 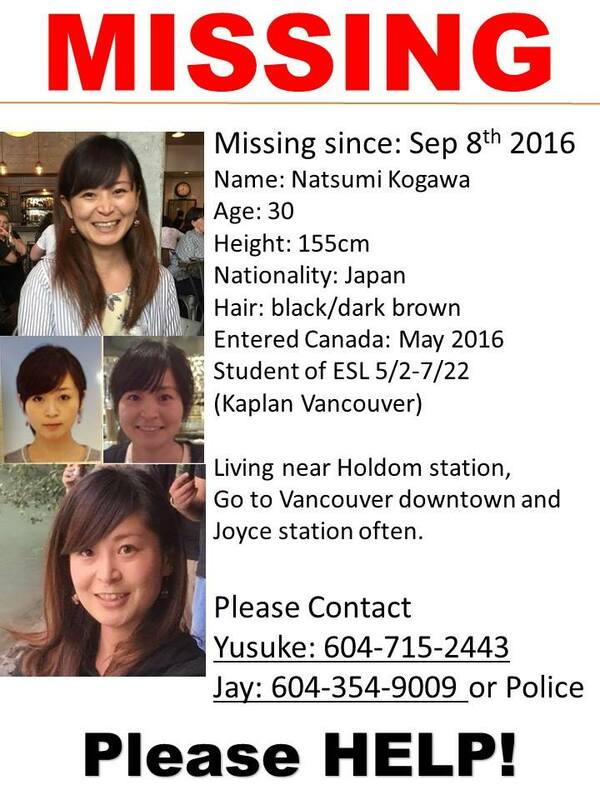 She lives 2 minutes away from Holdom sky train station in Burnaby. She often goes to the library in downtown, goes to her friend's place near Joyce station. There's no Amber alert for adults so spreading the word on social media is the only way.